My practice has developed specifically to enrich Freud's two criteria for the realized individual: the ability to love and to work. I am a psychotherapist and career development authority with a practice in New York City. I enjoy bringing the skills of a psycho­therapist—analyzing motivation, exploring conflict—into the workplace arena as well as in my office. I have considered, in books and articles, ways to leverage peoples’ transition skills while containing their ambi­valence toward change. My practice includes people contemplating career shifts as well as career development. In addition, as our society ages, I have seen the passion older people have for reinvention and developed a program and book to address this life stage. Read more about me. Authors Alan Bernstein and Peg Streep show us how to let go when we need to and how to start over. A guide to increasing our emotional and mental flexibility, assessing our goals, and knowing when to hang in or bail out, it tackles our tendencies to over­analyze, ruminate, and put a positive spin on situations we actually need to avoid. 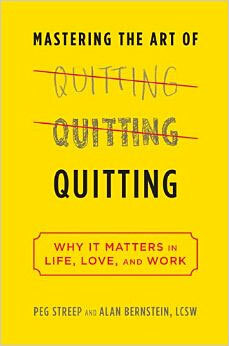 In a culture which perceives quitting as a last resort, the authors show that it's an essential tool for a happy and successful life. Copyright Alan Bernstein. All Rights Reserved. Photo Credits.